Nuclear batteries have been in use for military and aerospace applications, but are typically far larger. The University of Missouri team says that the batteries hold a million times as much charge as standard batteries. 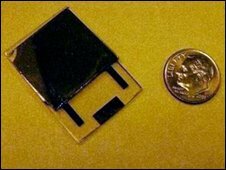 They have developed it in an attempt to scale down power sources for the tiny devices that fall under the category of micro- and nano-electromechanical systems (Mems and Nems). The means to power such devices has been a subject of study as vigorous as the development of the devices themselves. Nuclear batteries are an attractive proposition for many applications because the isotopes that power them can provide a useful amount of current for phenomenally long times - up to hundreds of years or more. As a result, they have seen use in spacecraft that are fired far off into the cosmos. But for applications here on Earth, their size has limited their use. The Missouri team, led by Jae Wan Kwon, employed a liquid semiconductor to capture and utilise the decay particles. Most nuclear batteries use a solid semiconductor to harvest the particles, but the particles' extremely high energies means that the semiconductors suffer damage over time. This means that to build a battery that can last as long as the isotope inside, they must be built larger. The team's solution incorporates a liquid semiconductor, in which the particles can pass without causing damage. They are now working to further miniaturise the batteries. And although the whole idea hinges on the use of radioactive materials, the devices are safe under normal operating conditions. "People hear the word 'nuclear' and think of something very dangerous," Dr Jae said. "However, nuclear power sources have already been safely powering a variety of devices, such as pacemakers, space satellites and underwater systems."